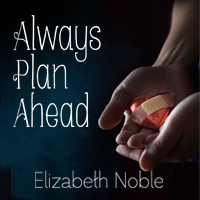 Elizabeth Noble is popping by to talk about her Mended Anthology release, Always Plan Ahead. Oh hello hurt/comfort one of the sweet little staples of many, many genres of writing and storytelling! It’s taken many forms and had other names dating back to the time humans began weaving stories and using the stars as characters. We’ve read it in books and watched it on the big and little screen. It’s in every culture and every age of humanity. Clearly it is a popular theme. Who doesn’t like their hero being comforted, loved and cared for by the other hero. Notice how I go from stars and through the ages to M/M romance? What is it about hurt/comfort that we like so much? Most human beings don’t really want to see someone hurt, but the hurting is important. Without the hurt we never get the comfort. It’s the comfort that speaks to something in us all. The hurt takes many forms. It can be mental anguish, physical pain, emotional trauma, or some combination of all three. The hero can get a broken leg, or in the case of Juan in Always Plan Ahead a hurt back. He can have the crap scared out of him and then his hero comes along to provide a much-needed sense of security. His friend can be hurt and he feels helpless and alone or maybe his family has shunned him (or he thinks they will) for being gay. The possibilities are endless. After the hurts comes the comfort. The understanding without the need to explain feelings. Strong arms and shoulders to lean on for support. A lover who is first, a friend, someone a guy can depend on no matter what. The real theme, however, of Always Plan Ahead isn’t the hurting, but how comforting someone can be when we least expect it. Juan’s long time boyfriend, Victor, a socially awkward nerdy guy becomes a hero in a totally unexpected way. He not only takes care of Juan, but the things in Juan’s life that are very important to him. Victor shows Juan those things are important to them both. Juan and Victor have been together for a long time. Victor is a sweet man, but hides it well. Most people see him as a bit cold and distant. Juan knows better. He is given a powerful reminder when an accident on the space station where they are both living and working leaves Juan temporarily helpless. Victor steps in, becoming Juan’s hero in some very unexpected ways. I think I’m in love with Victor!